It wasn’t by accident that the first five songs on my ultimate John Mayer mix included the word “love.” The songs work like a five-part series of my understanding of love. Track two is “Love Soon”, which comes from Mayer’s 1999 EP Inside Wants Out. Anyone who knows me knows that I do not use four letter words lightly. In addition to curse words, l-o-v-e was a serious word in my vocabulary that I reserved for the right moment. There was a time in my early dating stage with Jessie when we were saying “the opposite of hate” in an attempt to tiptoe around calling it love. This song was the perfect soundtrack during that era of my life. The third track on this compilation is “Bold As Love” from Mayer’s Where the Light Is: Live in Los Angeles release. In addition to the excellent musicianship that comes with Mayer performing live—the guitar solos alone are worth the price of admition—this live version includes an inspiring spoken word interlude about love that begins at the 3:10 mark. While Mayer’s history as a player might make the listener take his words —do as he says, not as he does—the words are no less poignant. “I’ve done everything in my life that I want to do except just give and feel love for my living.” This is like a pre-game pep rally for deciding to commit to someone. Preach it, John. “Love Is a Verb” is track four. The song speaks to a truth that I only fully realized after being married. Love is not just a feeling. Happiness, sadness, and everything in between are feelings that will come with love. Love is a choice. Love is an action. Love is a verb. Taken from 2012’s Born and Raised, “Love Is A Verb” proclaimed a message at a time when I was mature enough to hear and understand it because I was living it. Track five, “Who You Love” feat. Katy Perry, comes from Mayer’s latest release, 2013’s Paradise Valley has less lyrical nuances, but I like the fact that the final of my five track series of songs with “love” in the title is a duet because love is ultimately a tag team effort. 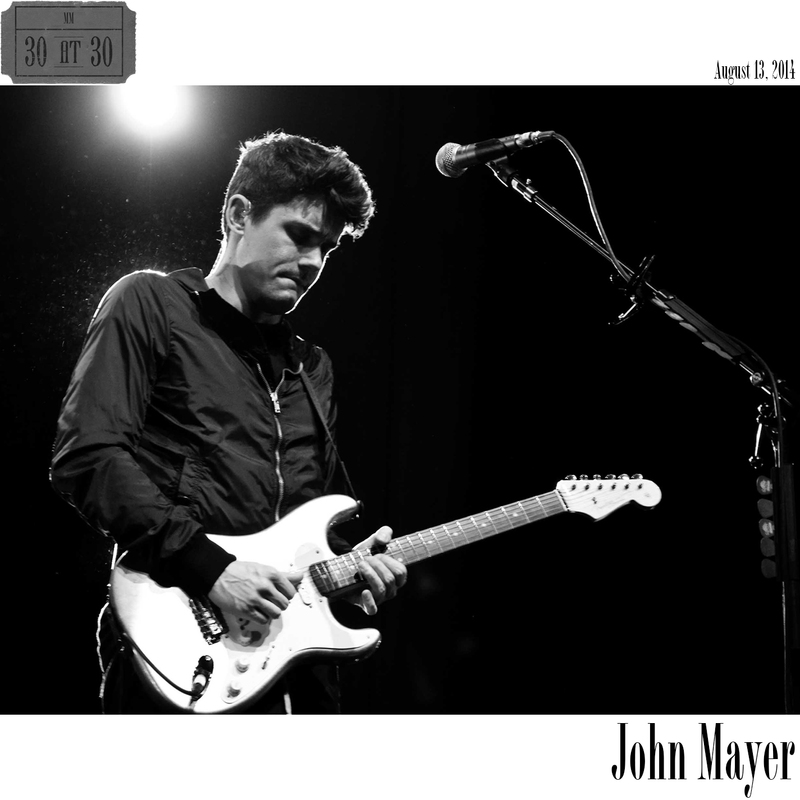 Tracks six and seven shift gears a bit jumping back to Room for Squares with “Your Body Is a Wonderland” and “No Such Thing”, a pair of catchy, crowd favorite singalong hits from Mayer’s early days. Mayer’s cover of Tom Petty’s “Free Fallin'” from the Where the Light is: Live in Los Angeles album is my track nine. Although Petty’s original is an all-time classic, Mayer’s slowed down, acoustic version is awesome and worthy of standing on its own. If you haven’t heard Mayer’s version yet, be sure to give it a listen. Tracks 11 an 12 come from Mayer’s 2003 album Heavier Things. “Daughters” is among Mayer’s finest bit of songwriting. The lyrics are primed to take on added significance in my life in the near future, especially if my child-to-be is a girl. Regardless, it’s an excellent bit of songwriting. “Something’s Missing” shows a more philosophical side of Mayer. This song and this album came out during a soul-searching period of my life. Like Mayer, I had a sense that something was missing from my life at the time, even if I was unable to put my finger on exactly what it was. I think Track 12, “Stop This Train” is one of the most underrated John Mayer songs. As a 30-year-old, these lyrics stick with me even more so than when the song first came out on 2006’s Continuum. As I prepare to watch my parents become grandparents it’s hard not to want to stop the train and prevent time from going by too quickly. Track 13 is “A Face to Call Home” from Born and Raised. It is no surprise that this song shares an album with the aforementioned “Love Is a Verb.” Again, there is a maturity in the lyrics here about building a life with someone. I really connect with the idea of the idea of home being about a person more so than a place. Track 14 “Gravity” and track 15 “Come Back to Bed” are great examples of Mayer’s ability to slow down the tempo with bluesy love grooves. Each song features a memorable guitar solo and lyrics that get into the soul and squeeze. Finally, track 16 “Born and Raised” and track 17 “Wheel” felt like the perfect pair of songs to close the compilation. In “Born and Raised” Mayer puts his fears and anxieties out there about growing up. You spend so much time dreaming of and thinking about what you’re going to be when you grow up. Then, all of a sudden, you’re a grown up, and you’re left wondering, OK, now what?